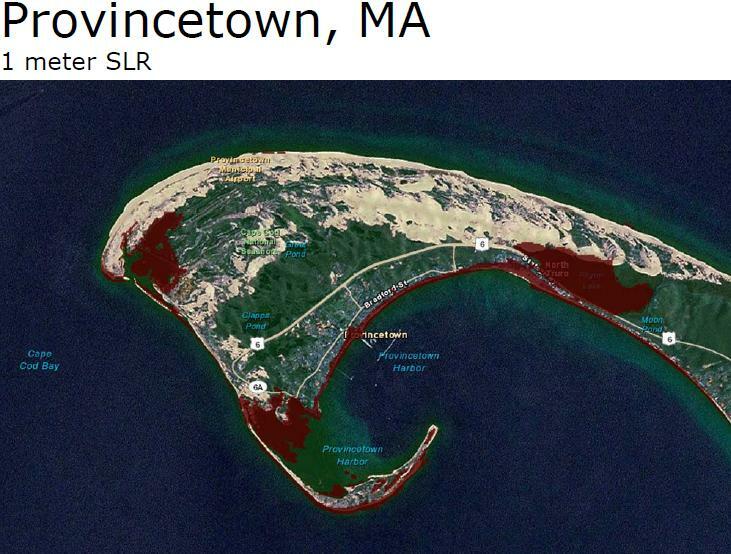 One of our citizen scientists used Woods Hole Group’s fish mortality reporting system to notify us of a recent fish kill here in Falmouth, MA. Turns out she wasn’t the only one to notice the 16 dead striped bass washed up on the shores of Little Pond (see Cape Cod Times and Falmouth Enterprise). While local officials and scientists are confident in their assessment that this event on Little Pond resulted from low dissolved oxygen levels (due to area septic system nitrogen inputs spurring an algae bloom), we are less sure about the cause of other fish kills that have occurred in the region. For this reason, we have developed an iPhone app and a voice/text reporting system to track these events and hopefully obtain fresh samples for analysis. 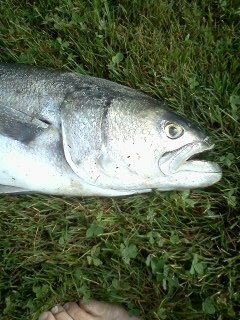 We’ve already fielded a handful of reports so far this year, one of which yielded a bluefish for necropsy by our team of researchers. As we collect more data, we hope to get to the bottom of this disconcerting phenomenon. So, please, be our eyes out on the water this summer – download the mCrowd app (‘Buzzards Bay Fish Mortality’ is a task within this app) and become a citizen scientist. What would a Friday be without some fatidic architectural renderings? The New York CitiVision competition asked the question “If the future is gone, what past is expecting us?”, pressing designers to think about what the future city might look like if a critical choice had been made differently or how it might adapt to an already compromised future. The responses run the gamut from eutopian to dystopian, but what is really notable to us is that sea-level rise seems to be on the collective consciousness. We’ll chalk up the accuracy of sea-level representations to artistic license, and be thankful that designers are thinking about how cities could adapt to rising seas – however fanciful the adaptation. Two intriguing articles released recently proving, once again, that there are two sides to every story. As with many of the expected results of climate change, there will be winners and losers in the sea level rise story. Areas potentially impacted by sea level rise: Weiss JL, Overpeck JT, Strauss B (2011) Implications of recent sea level rise science for low-elevation areas in coastal cities of the conterminous U.S.A. Climatic Change DOI 10.1007/s10584-011-0024-x. It has been a busy winter here at Woods Hole Group. Waking up this morning to a dusting of snow here on the Cape, we were reminded that this winter has also been a mild one. And so we wondered if this milder winter has resulted in fewer and less intense storm-associated high water and wave events and, by extension, less shoreline erosion. As a start, we decided to look at water levels by examining the residual tides at a nearby NOAA station between September 1 and January 31 of this winter and last winter. Residual tide is the difference between the elevation of the observed water level and the elevation of the predicted water level. NOAA makes tide predictions based on known factors that influence tidal height: gravitational pull of the moon and sun, coastal morphology, local water depth, and regional bathymetry. These predictions also assume average weather conditions. The observed water level may differ from the predicted water level when weather conditions are abnormal. Prolonged onshore wind and low barometric pressure systems (i.e. storms) drive sea level higher than predicted, thus positive residual tides (observed exceeds predicted) are indicators of higher than average coastal storm activity. It appears that there were a few more major storm events during 2010-2011 (red peaks) than during 2011-2012 (blue peaks). 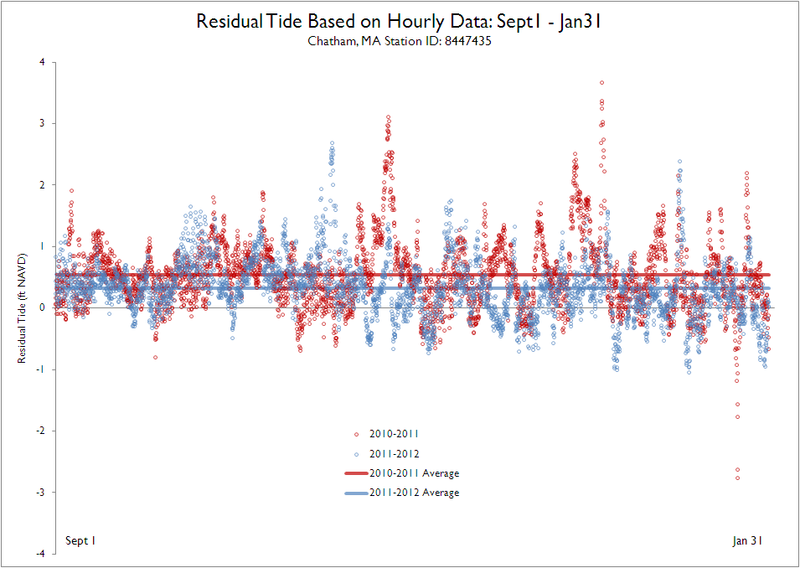 Also, on average the residual tide during 2010-2011 (red line) was higher than during 2011-2012 (blue line), meaning there was a greater difference in observed vs. predicted water levels last winter than this winter. 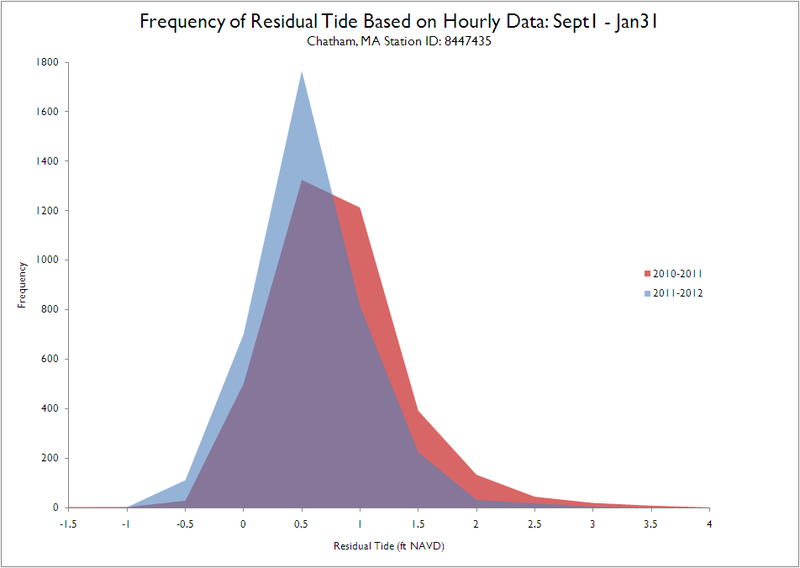 We see in this histogram that there was a lower frequency of larger residual tides in the 2011-2012 season than in the 2010-2011 season. The shift in the curve from right to left (red to blue) indicates that storms affecting Chatham were less intense this winter than they were last winter. We haven’t determined if these differences are significant, and a look further back into the historical record would provide a better perspective than this snapshot investigation, but the data are consistent with our anecdotal experience this winter. Whether or not this relatively calm winter will spare our shoreline from excessive erosion remains to be seen. 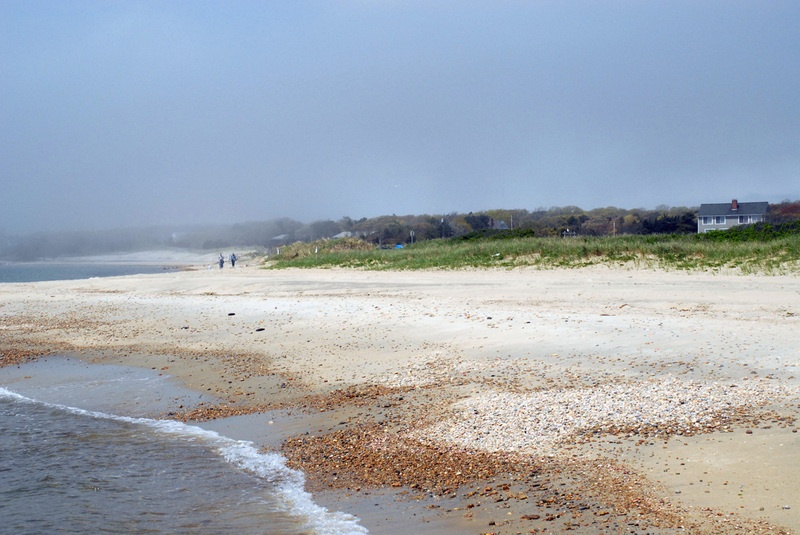 Reports from some hotly contested cabins on Chatham’s North Beach Island indicate that so far, the seas have been merciful. What has this winter brought to your area? More storms or fewer storms? More erosion or less erosion than usual? Reports from the field are always welcome.